When the children were little, we would all sit on Friday evenings and watch TOTP together (Top of the Pops, oldies!) ‘as a family’. Should a Bruce Springsteen (say) take to the stage and bellow blue-collar blues, Oliver’s verdict would be equally direct and thumbs-down. ‘Shouting,’ he would say. Songs were either one or the other and never up to the mark in his book. I thought of Oliver as I prepared to go to hear and see Mumford & Sons during their Delta Tour, which continues till June. ‘I can’t wait to tell people I DIDN’T see Mumford & Sons at the 02,’ my husband kept saying in the run-up to the concert. ‘I mean, my aunt used to complain that the Beatles sounded the same, but Mumford & Sons! You really can’t tell when one song stops and another one starts.’ Well, thank God Ivo’s aunt is not alive to hear today’s top acts. Compared with the Fab Four, the output of much of today’s ‘talent’ is uniformly beige. Actually, beige is wrong. 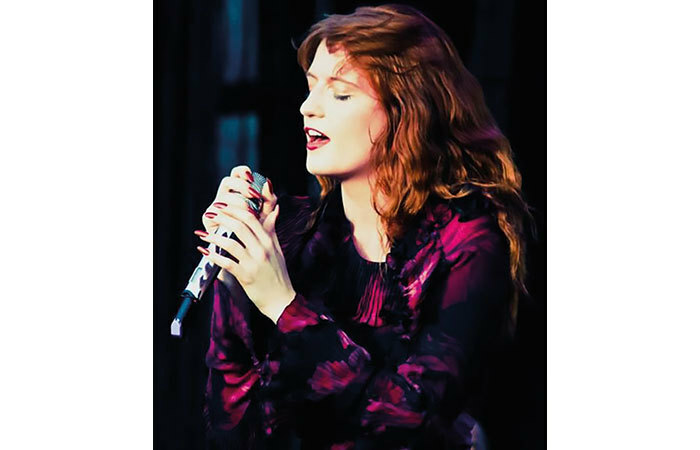 Florence Welch, of Florence + the Machine, is more floating purple dress, swirling Pre-Raphaelite locks, but all her songs sound much the same. I was in the hairdresser’s and they played her new album (I think) but it could just as well have been her old one. Moving on to stadium-fillers: U2 have just toured and gave Mariella Frostrup a shout-out when they played the 02 (the trivia that crowd the brain), but I would bracket U2 and Oasis together: great bands, terrific live shows but... The songs sound at least a bit the same. With Ivo’s words ringing in my ears, I tubed towards the tweedy, flat-capped folkies with anticipation. After all, I bought Babel, the album, with my own money. I listen to the Mumfords – gospel which is basically not badged as religious – for pleasure. However, it became instantly clear that the 02 – probably the greatest rock venue around – did not amplify their aspirations to be a big stage act. The staging was too ambitious: it was a floating platform in the middle of the arena, with screens, and was far too big for two drum kits, a prancing Struwwelpeter of a guitarist, Marcus Mumford on vocals, and someone frigging the banjo. When a Mick Jagger or a Freddie Mercury came on stage, they owned it. These public-school folk-rockers and God-botherers just looked lost, until one of the four encores, Timshel, and they stood around one mic and sang their hearts out to the strumming of one banjo. What I saw was a great pub band with a long set list of 21 songs... that all sounded the same. Not that any of that is a bad thing, you understand. It’s what the doctor ordered. And by the time they had rocked and strummed and frigged through almost two dozen songs, when we got to the big one, I Will Wait, the crowd was almost delirious with anticipation and joy. I would go so far as to say that even Ivo’s aunt’s foot would have been tapping. Book now while stocks last!